For Falando Docemente, Matta assembled a like-minded crew of Brazilian compatriots  guitarist Chico Pinheiro, drummer Mauricio Zottarelli and percussionist Fernando Saci  to provide an authentic vibe on several alluring bossa novas. Saxophonist Harry Allen, a guest faculty member at Matta’s SMJ camp, was paired with Spitzer on Hank Mobley’s hard bop anthem This I Dig Of You, the luxurious ballad Early Autumn and Spitzer’s lone original here, Blues for Harry A”. Rising star pianist-composer Julian Shore was recruited by Matta to write string quartet arrangements on The Very Thought Of You, Nature Boy and Sonny Rollins’ Valse Hot. And Spitzer responds in each setting with authority, clarity and a beautiful singing quality. Gil Spitzer. Photo: Harry A. Spitzer. Recorded at Eastside Sound Studios, New York City. Recorded on February 3, 2017 by Engineer Eric Elterman. Recorded on February 4, 2017 by Engineer Duff Harris. Mixed and Mastered at Boomtown Studio by Eric Elterman. 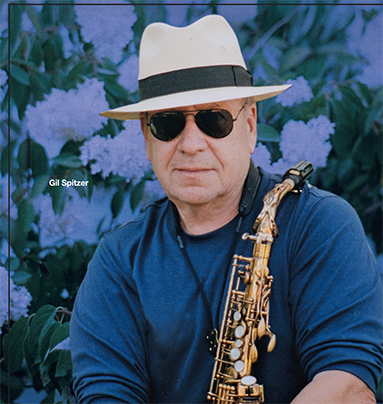 Photography by Gil Spitzer (Front Cover), Harry Spitzer (photo of Artist), Chris Drukker (Session). Graphic design: Chris Drukker. Producer: Nilson Matta. Executive Producers: Gil Spitzer, Joachim “Jochen” Becker.